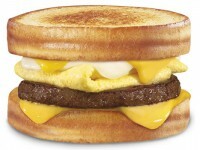 I am a pretty big fan of the Carl’s Jr breakfast sandwiches. 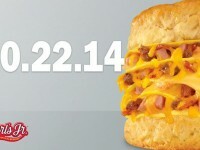 I will routinely grab a 2 for $3 sausage egg and cheese biscuit on a Saturday morning with the family. 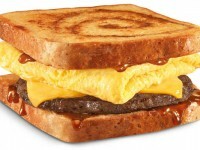 One thing I absolutely love is French toast, to the idea of a Carl’s Jr French Toast sandwich really peaked my interest. 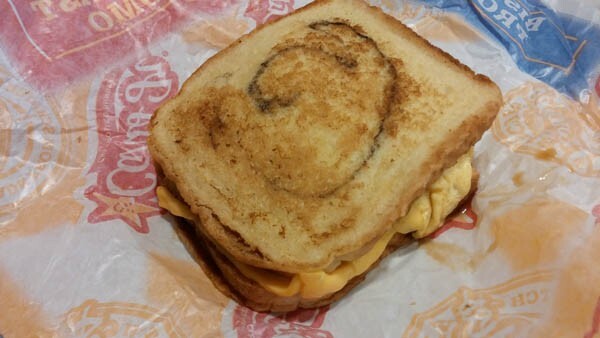 The Carl’s Jr Cinnamon Swirl French Toast Breakfast Sandwich features two pieces of French Toast with a cinnamon swirl on each piece. 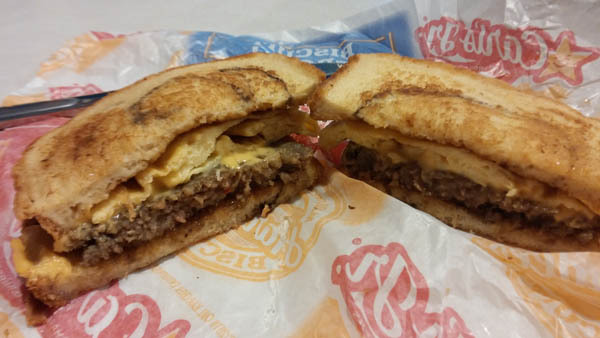 Inside, we have a folded egg, American cheese, and the option of bacon, ham, or sausage. I grabbed the sausage version, which was $3.29, and I used a BOGO coupon found at the Carl’s Jr website which made this a better value. What I found with this breakfast sandwich was a savory / sweet combination that was full on delicious. I felt everything worked well together and it was a great product overall. Let’s dive into each element. The folded egg by itself doesn’t have much going for it. 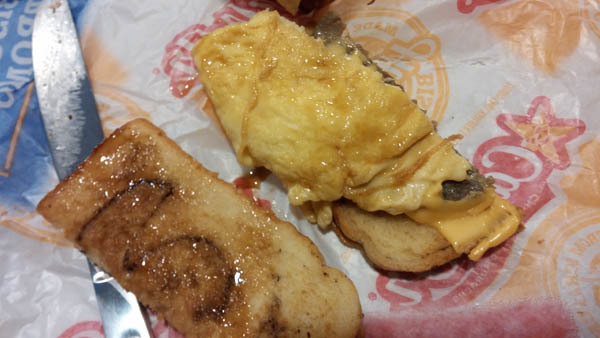 There is a good amount of it, but with the saltiness of the sausage, the egg really shines. The added layer of American cheese wraps the egg/sausage combo like a gooey blanket, locking in the savory flavors. The French toast had a very light cinnamon swirl. It was light enough that it was difficult to discern behind all of the other ingredients. I would have liked the French toast to be a little bigger. I regularly make French toast myself with Texas toast, so these little pieces of French toast were a little disappointing, but they held their shape well. The real hero in my option is the maple syrup. There is nothing special about the maple syrup, but it really brings the entire sandwich together. 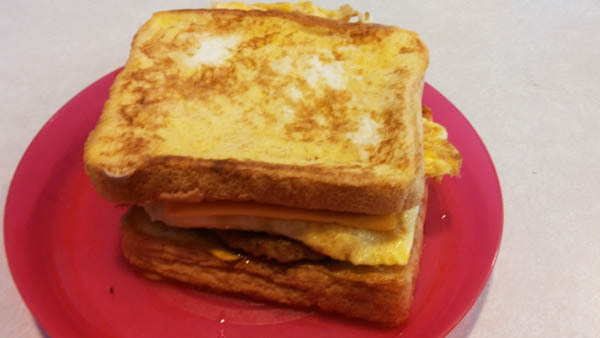 It is the mortar between the sweet French toast and the savory egg, cheese and sausage. For me, the most important part of any breakfast sandwich is how the different flavors help each other, and I felt that requirement was nailed with this sandwich. Most breakfast sandwiches are too salty, with just a protein, egg, and a savory biscuit. The added sweetness creates a balance that is amazingly delicious. This is close to a perfect score (on taste) however I knock it down a few points for the price, which is slightly higher than I’d like to pay, and for the somewhat smaller size of the French toast. My advice thought would be to eat this with a fork, as it can get a little messy. Also, I liked it so much that I decided to make my own at home. It took way longer to put all the elements together, and didn’t taste quite a good, but I’m happy with it.